Valentine’s Day Ideas –gifts and MORE! Valentine’s Day is Thursday, February 14th…and we have some gift suggestions complete with some romantic ways to spend the evening. Plan a mini getaway. What is more romantic than planning a trip away with the person you love? Buy tickets to a show or event. Book a table at a cozy restaurant. Do dinner and a movie at home. 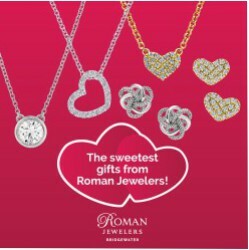 Roman Jewelers has gifts starting at $275–and remember, chocolates melt but jewelry lasts forever.